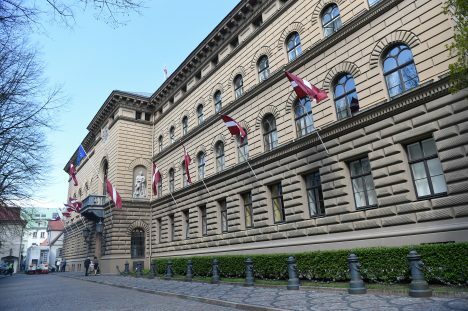 Heads of coalition factions invited Saeima’s Legal Affairs Office to provide an opinion in regards to regulations under which the parliament would be justified in requesting dismissal of the entire National Electronic Mass Media Council or some of its members. The opinion was requested because of the personnel selection process for the posts of LTV board chairman and board member for digital development and content affairs. The Legal Affairs Office concluded that the media council should have complied not only with regulations of the Electronic Mass Media Law when organizing the personnel selection process but also the Corporate Governance Law. The council, however, stressed that only Electronic Mass Media Law is binding to it. Answering the question about the conditions under which the Saeima would be able to dismiss the council or some of its members, the Legal Affairs Office stressed the independence of the media regulator. On top of that, an EU directive came to force just recently. At the same time, the Legal Affairs Office turns attention towards the fact that one of the requirements for council members is having a good reputation. «This particular requirement was used to dismiss a council member in the past,» the opinion mentions. Lawyers stress that loss of reputation has a wide range of interpretations and should be used very carefully for dismissal of council members. In cases when there are suspicions about possible violation of the law by the council or its members, such an assessment should be performed by competent independent institutions, lawyers explain. Political party Attīstībai/Par!, which proposed performing an assessment of the council’s work, believes the Legal Affairs Office’s opinion proves the personnel selection process in LTV should have been organized differently, adding that now the situation will be handled by Saeima’s committee. «This committee is able to invite mass media council members for interview and determine the opinion of competent institutions and receive reports if any regulations were breached. Then it will be possible to think about any possible actions from the Saeima,» Attīstībai/Par! leader Daniels Pavļuts told the programme. Pavļuts also notes that results of the prosecutor’s office’s investigation will play a major role in decision-making process. The investigation was commenced following a request from Latvian Journalists Association. Meanwhile, council chairperson Dace Ķezbere says she is prepared to explain her actions. According to her, council members did not violate the law. With that, the council will defend itself to the last. Organization of a new personnel selection process will be decided at the end of next year. As it is known, both the chosen candidates have decided to step down from their new posts in LTV board.